Next month brings us to Christian Aid Week. The dates are 12th – 18th May, so Christian Aid Sunday will be May 12th and our House-to-House Collection runs through till Saturday 18th. Sometime soon, I will make contact with our regular Collectors regarding everyone’s availability, but we can always use some more helpers. If you are able to offer some time in this very important cause, please let me know. WHAT HAVE OUR YOUNG PEOPLE BEEN UP TO? Quite a lot, it seems! As well as the full news update from Iain Shaw (see below), we have some interesting news from our 17th EK Guides Group and our Sunday School. Please visit their pages and click on ‘Our Space’. The Cabaret Evening with Alex Proctor (singer, guitarist & entertainer) was a huge success! Everyone had a great night and were truly entertained! Our grateful thanks, once more, go to everyone who made this such a success and especially to those who attended the night. We managed to raise £289 for church funds. Our next fund-raising event will be on the 31st May when the Coalburn Silver Band will be giving a concert in the church. Thanks to your generosity and kindness, the sum of £378.05 was raised in our Spring Appeal for cleaning products. This year is the 50th anniversary of the Church of Scotland’s Stamp Appeal. The money raised from the sale of used stamps goes each year to help projects abroad. In 2019, we will be supporting the Chigodi Women’s Centre to deliver a broad range of skills training to address the challenges faced by women in Malawi. The Centre aims to improve the women’s socio-economic status and increase their future chances of employment. For many years now we have been involved in a Lent study group with our fellow Christians in St Bride’s, United Reformed Church, East Mains Baptist Church, and The West Kirk. This year it is our turn to host the group, and we meet on a Friday at 12pm, share some soup and bread, begin our study around 12.30pm and aim to finish by 1.30pm. We began on 8th March and will continue until 12th April. The material we will be using has been prepared by Churches Together in Britain and Ireland and you can find it on their website (ctbi.org.uk). Its title is “The mystery of God,” and over the six weeks we will look at subjects like the mystery of suffering, and the mystery of relationships. We will take it at our own pace, and it won’t be too heavy. Youth Worker Iain and a team of volunteers organised a very successful 'Messy Church' afternoon event in Glebe St Hall on Sunday 24th February. Aimed at all the family and all ages, activities included food, crafts, games, including a huge colourful parachute, and worship. It was especially great to see a number of new faces, and we hope and expect all will come again to the next event, which is proposed for 28th April, 4pm-6pm in the Glebe St Hall (Easter theme). The final Brexit decision, when it is finally made, will be a key moment in UK modern history and the consequences of the result are uncertain. When this special prayer, written by Rev Dr Martin Johnstone, (Secretary to the Church and Society Council of the Church of Scotland) was first read out in Church, it was almost certainly not expected to still be relevant in April, three months later! God, who in Jesus broke down all barriers between people of different races, rich and poor, male and female, Jew and Gentile, between heaven and earth, we worship you. God, at this time of heavy responsibility, as decisions about future relationships with our neighbours in Europe are being taken, we pray for our leaders: that they will lead wisely; that they will listen attentively; that they will exercise grace; and that they will know peace in their deliberations. God, at this time of uncertainty, within our nations and communities, we pray for ourselves: that we will remain open to the stranger; welcoming to the neighbour; and committed to those who struggle. God, we pray for your church of which we are a part: that we might be a place of honest reflection; respectful dialogue; open friendship; humility and reconciliation. We pray that we might be a community that points to heaven, and shows ways in which heaven is glimpsed on earth. A big thank-you! The total was £948.14 which is an increase of over £100 on last year.In addition, a number of people signed the Gift Aid form on the envelope so Leprosy Mission Scotland will reclaim tax and increase our total by £129. Since the UK Government will double donations to Nepal, our gift (£1073.39) will become £2,154.28. Well Done! On 21st April this year we celebrate Easter Sunday the most amazing event in the history of the world – the resurrection of Jesus from the dead. This pivotal moment in history shows us how much God loves each and every one of us unconditionally. Easter is the gift of HOPE, the gift of PEACE and the gift of LOVE. Let us rejoice in HIM who gives all of these things. Since my last update we have held two very successful events - Our first ever Messy Church on the 24th of February on the theme of Love and our second family film afternoon on 24th March when we watched The Greatest Showman. At Messy Church we had around 60 attend which included many families with children. I hope everyone who came along had an enjoyable fun filled time – judging by the smiles, noise and the amount of food eaten I truly believe they did. Messy Church includes arts, crafts, games, puzzles, competitions, worship and food as well as providing a warm Christian welcome and is suitable for all ages. It takes a team to make Messy Church work and to all those who helped and supported the event in whatever way please accept my sincere and grateful thanks – you all helped create a great family friendly atmosphere and contributed hugely to a successful afternoon. I pray that all those who attended will reflect positively on their time with us and will consider coming back again to our next Messy Church. More information on this can be found on the next page but please take a flyer or two which can be found in the various rooms & halls of the Church and pass them to family, friends and neighbours so we can get even more at the next event. 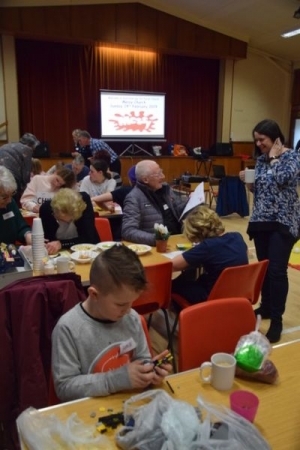 There is an update and photographs of the February Messy Church on the Church website. The second event was a fun family film afternoon in The Glebe St Hall where we watched The Greatest Showman – we had around 80 in attendance. Many families and children came along and had a great time dancing and singing along to the music in the film as well as enjoying popcorn, pancakes and refreshments. My sincere thanks to all those who helped make this a very successful event and equally my thanks to all those who came along to support the event. Based on this success I will aim to put on another such event very soon. If you have a film you think would be suitable for family viewing please drop me a text or email with your suggestion. 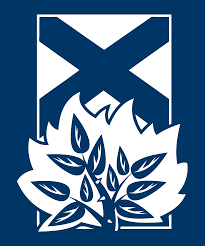 On Thursday 21st March I attended, on behalf of our congregation, a seminar held by Hamilton Presbytery in Blantyre Old Parish Church entitled “Aspirations for Ministry with Children & Young People in the Church of Scotland”. It was meant to be a one-off session but I think there may be several more which will require to be arranged as there was lots of discussion, thoughts and general sharing of current practice but not a lot of answers to the question which the seminar was asked to consider – How can we get more children & young people into our Churches? Answers and thoughts to me on a postcard please – but in all honesty if anyone has any suggestions or ideas of an event, session or group that could be set up or at least considered within our congregation please email or text me and I promise it will be given full consideration. Looking briefly to the next few months other events planned include, an Easter Messy Church on Sunday 28th April, then in conjunction with the Youth Group a church family quiz night on Sunday 12th May followed by on Saturday 8th June a family 6k (approx. 3.5 miles) sponsored walk around The Watersports Centre, Strathclyde Park, Motherwell (this venue has still to be confirmed) to support the Christian Charity World Vision, also towards the end of June I hope to have a fun family day including games, sports, treasure hunt and a barbeque. I am also in the early stages of planning and preparing a summer holiday club for between 3-5 days during the school summer holidays probably in August nearer the time when the schools go back – more information on this will be in the next magazine and church intimations during April & May. To run such an event needs a team of volunteers so please give it your prayerful consideration and if you would like to get involved in helping out, even for only one of the days, let me know. I am privileged to be part of the Calderglen High School chaplaincy team, and for four days recently, we ran a programme for all the P7 children in the feeder primary schools called “The Easter Code.” Part of my responsibility was to run the craft tent, where we looked at the part the cross played in the story of Holy Week and Easter, and then talked about how the cross went on to become the symbol of the Christian faith, before the children went into the craft activity. The groups are usually only between six and nine children, so there is time for conversation to take place while they are doing their crafting. As always, the children bring their own contributions, mostly sensible and insightful. In one of the groups, a child asked me how Christians could possibly see the cross as a symbol of their faith when it was how Jesus died. He said, “If he was shot, would you have a gun as a symbol of your faith?” It really made me think. But the cross is more than just how Jesus died, isn’t it? It’s why he died which is the important bit; he died to take away all that can possibly divide us from God. He died so that nothing can separate us from the love of God and he died that we might have eternal life. That’s why the cross is the symbol of our faith. I hope you are able to join us at our Holy Week and Easter services where we can walk that last road of Jesus’ life through the cross and come out victorious on Easter Day.